THT EMPIRE GRIND PRO Chest Protector Padded Vest - L/XL. They loop on the arm sleeves that attach to you Grind THT elbow pads to keep everything where it belongs. Airsoft Gun and Paintball Gun Information. Chest Protector Padded Paintball Vest Pants, Arm Guards 2 Shirts Large 1 Pants Large, 1 Set Arm Protectors. Extra protection for critical areas is necessary to ensure safety and comfort while playing paintball, and the Empire Battle Tested Bulletproof paintball chest protector is the ideal choice for serious woodsball operatives or scenario and tactical players. Empire Neoskin Chest Protector F6. Lightweight and breathable full torso and shoulder protection. Airsoft Gun and Paintball Gun Information Clothing / Apparel. Airsoft Guns are TOYS and comply with all Federal Laws and Regulations. 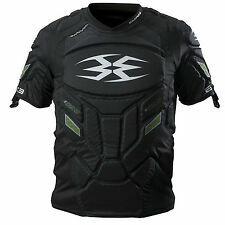 The Empire BT THT Folding Chest Protector is lightweight,breathable, and reversible. 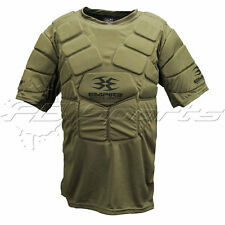 This stylish chest protector is tactical black onone side and tiger-striped camo on the other. Slip into one foryourself and feel the protection. Extra protection for critical areas is necessary to ensure safety and comfort while playing paintball. The Empire Battle Tested chest protector is the ideal choice for serious woodsball operatives or scenario and tactical players. Empire Neoskin. Being sold by reputable paintball dealer (PB Sports ). Chest Protector. A heavy gunner can mount 4 of the 3 4 pod pouches to carry an unbelievable 28 pods, or almost 2 full cases of paint! It doesn't stop there, because there's still room to add more pouches like the bottle pouch for air tanks and even a pistol holster! Waist support belt feels great on whether you load up the vest with weight or not. Vest weighs about 2 lbs - 4 oz. Keep in mind vests always run smaller in the chest than shirts do. Inside back water bladder pocket. Extra protection for critical areas is necessary to ensure safety and comfort while playing paintball, and the Empire BT Bulletproof paintball chest protector is the ideal choice for serious woodsball operatives or scenario and tactical players. NEW Empire Paintball BT Battle Tested Duty Belt - Tan. Sizing (waist). Universal ID Pouch - Terrapat. Empire Battle Tested. Empire Neoskin. Being sold by reputable paintball dealer (PB Sports ). Slide Shorts - Youth. 1- BT M-8 Paint Grenade. Universal ID Pouch - ETACS. Empire Battle Tested. BT Terrapat camo pattern. 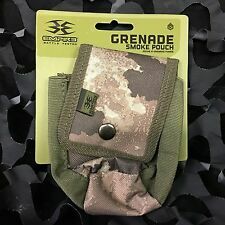 The Empire Battle Tested Multi Pouch is a versatile pouch for all your small needs on the field. The BT Multi Pouch is a tactical necessity! Tough nylon material. We will respond to your inquiry in 24-48 hours. NEW Empire Paintball BT Battle Tested Duty Belt - Tan. We will respond to your inquiry in 24-48 hours. WE DO NOT TAKE BACK ANY USED OR OPENED PRODUCT. Radio Pouch - Terrapat. The Empire Battle Tested MOLLE Radio Pouch is designed to hold most of the popular handheld radios. When mounted on a MOLLE vest from Battle Tested Paintball, youÆll be able to stay in touch when in the middle of the firefight. Universal ID Pouch - Terrapat. Being sold by reputable paintball dealer (PB Sports ). Empire Battle Tested. BT ETACS camo pattern. The BT THT ID Pouch has a clear plastic window under a Velcro flap. Plastic ID card window. Velcro flap for quick hidden ID display. We will respond to your inquiry in 24-48 hours. NEW Empire Paintball BT Battle Tested Molle Vest Grenade/Smoke Pouch - Terrapat Camo (32218). BT Terrapat camo pattern. The Empire Battle Tested THT Grenade/Smoke Pouch is perfect for the paintball grenade thrower! BT Terrapat camo pattern. The BT THT ID Pouch has a clear plastic window under a Velcro flap. Plastic ID card window. Velcro flap for quick hidden ID display. We will respond to your inquiry in 24-48 hours. Extra protection for critical areas is necessary to ensure safety and comfort while playing paintball. Being sold by reputable paintball dealer (PB Sports ). The Empire Battle Tested chest protector is the ideal choice for serious woodsball operatives or scenario and tactical players. Empire Neoskin. Being sold by reputable paintball dealer (PB Sports ). Slide Shorts - Small.